No I haven’t forgotten how to count – Day 3 will come to you later today – wifi permitting – it’s a fine balance using the dongle while in port as the on-ship connections have been temperamental. After our little excursion back on land yesterday we’ve been “hitting the books” again today. Here’s a little glimpse of the talks I listened to, and what my “take home” message was from each of them. 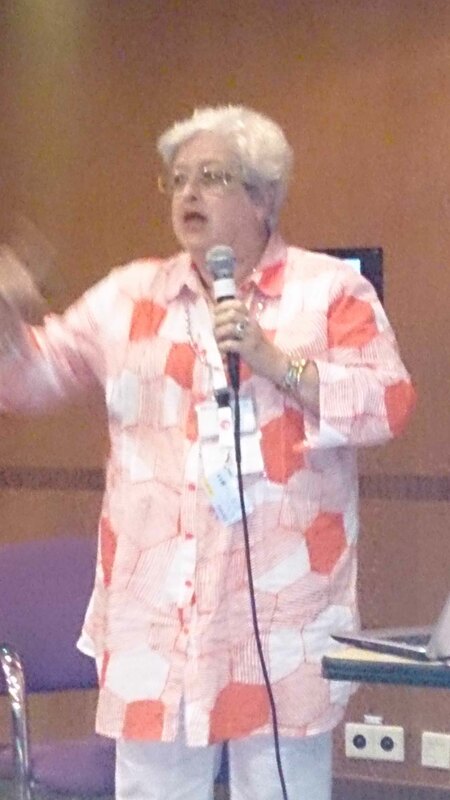 Maria Northcote’s presentation on Using free Podcasts kicked the morning off early today. Maria’s calm presence and professional skill came to the fore as she worked through default positions B-F trying to solve various problems. All those who attended really enjoyed learning more about her podcasts with their tips and tricks and she taught us all about new podcasts we might enjoy. One suggestion was to look at the podcasts published by archives and libraries. If you haven’t been following Genies Down Under, do yourself a favour and have a listen. Also search your favourite specialist library or archive to see if they present general historical or informational podcasts. Key Message: These are great learning tools which you can use in your family history. I’d been really keen to listen to Helen’s talk and it had been on my wish list all along. I did manage to see a little of it, but with my talk coming up next the butterflies were kicking in so I took myself away a little earlier to draw a breath. There were lots of good ideas for creative timelines, mainly using Excel. I’m quite familiar with the program but it hadn’t occurred to me to use the graph potential in the ways Helen suggested, including colour coding. I’ll certainly be using this option in my research when I get home especially with those niggly McSherry/McSharrys who seem determined to elude me. Hopefully it will help me see anomalies. I’ll certainly be looking at the presentation to have a closer look at Helen’s suggestions. Key message: Try drawing up timelines and graphs to track your ancestor’s events, and combine it with historical events as well. 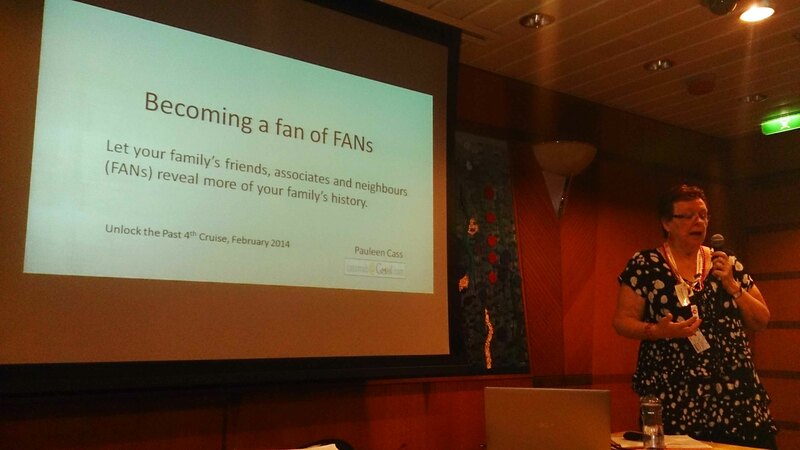 Some strange woman called Pauleen Cass then talked about Becoming a fan of FANs (Friends, Associates or Neighbours). I’ll leave it to others to comment on that. Key message: Cast your net widely, look beyond your direct line. 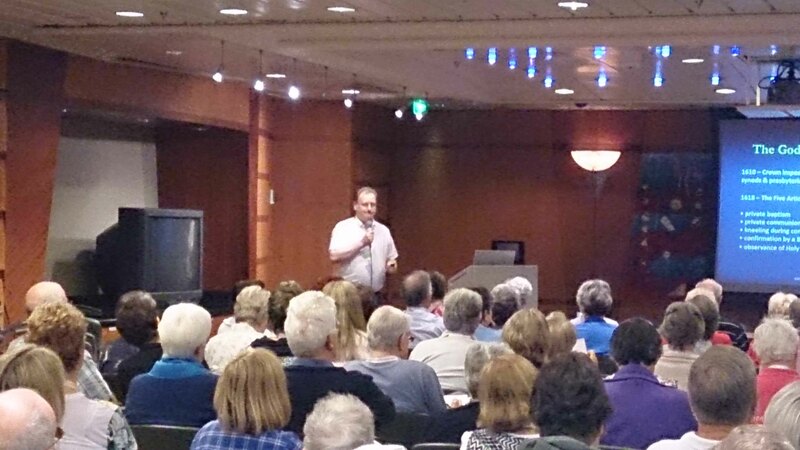 After a short break it was back to the main conference room to listen to the engaging and ever-humorous Chris Paton explain to us about the Godly Commonwealth …the vagaries and complexities of the Scottish church structures in an historical context. It also explains why we may not find out ancestors in Scotland’s People, wonderful as it is. I think I’ll be buying a copy of Chris’s Unlock the Past (UTP) book on the topic. Key message: Buy the book –there’s a lot to get your head around! Have you explored all the UTP collection of publications? They are really great and their content routinely belies their slight appearance. They’re available as e-books too so perfect for taking away when you’re researching. Key message: Check out the UTP book list. If there’s one downside to genea-cruising, it’s the sheer smorgasbord of conference topic choices. Sometimes you just have to take time out to chat with fellow genies, enjoy their company and learn about what they’re researching and how they go about it. Key message: Sometimes you have to skip class to spend time with others and enjoy their company. With so many Irish in my family how could I go past Chris Paton’s Irish Records Online (and accompanying book)? Chris had so much to offer and he mentioned all my favourite Irish sites, including Family Search, Roots Ireland and Irish Genealogy. One place I haven’t explored is the PRONI website as I don’t have any Northern ancestors but his reference to the learning resources has convinced me it will be worth a look. Chris also told us about some great releases due to come out soon from the Republic of Ireland’s Irish National Archives. I’ve already tried to find Pension Applications for my Mary O’Brien’s relatives when visiting Ireland but I’ll be looking again when they are released. I’d so love to find that Honora Garvey had applied for a pension, citing those 1841 and 1851 census records. One qualification that Chris made which I think is important is that Roots Ireland data is drawn from whichever records that county’s societies have been working on. This just might explain why there are gaps in what you’re finding. I certainly know I’ve got church entries which don’t appear in the Roots Ireland database and conversely it has records I’ve not found elsewhere. Anyone who has attended the many UTP sessions in the capital cities doesn’t need me to tell them that Chris Paton is one of those speakers whose talks are full of content, but presented in such a way as to fully engage our attention. Take home message: keep an eye on the Irish National Archives for new releases. Oh, and buy Chris’s UTP book…there was a big queue lining up to do just that. Another engaging speaker is Jill Ball aka GeniAus whose talk today was about LibraryThing, an online program which enables you to catalogue and tag the books you own and read. You can also snoop at compare the books your fellow genies own and see what they’ve read that you might find useful as well. This program is simple but diverse and Jill took us on a whirlwind tour of it in her allotted 25 minutes, convincing many people to adopt it as their own library system. Take home message: Library Thing is a great tool for small societies which want to catalogue their library to professional standards. Shauna gave a great talk setting out the huge variety of newspaper sources which are available to us. We are so very fortunate in the resources which are available to us. Shauna reminded us that stories were often syndicated and published in newspapers far and wide, so if you we can’t find them here, online or on microfilm, to try indexes and also overseas newspapers including Papers Past. There are great online newspaper resources but it’s fair to say they don’t quite match Trove for usability. Key messages: If you don’t have a National Library of Australia card, sign up for one (they’re free) and also sign up for Trove so you can correct text, and add tags and lists to categorise stories relating to your research interests. 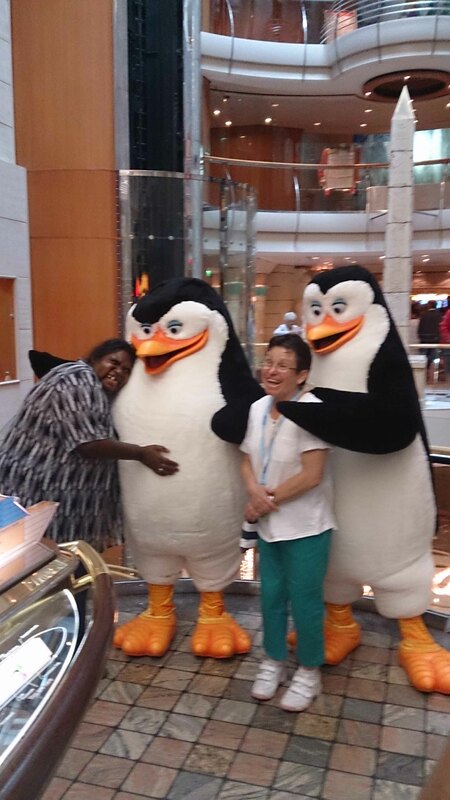 Meanwhile back in the real world of cruising, the penguins were a huge hit on the Promenade Deck. I thought this photo was just gorgeous. As always one of the sad things about conferences is there are always competing streams of topics which you’d love to listen to. With 245 genies onboard it can be challenging to connect up as well and lists are being prepared to combine research interests. 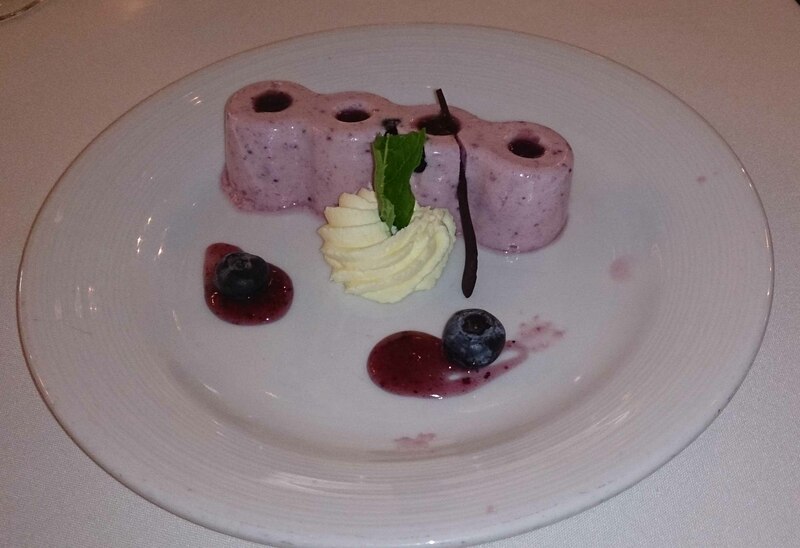 And then there’s the dessert choices. 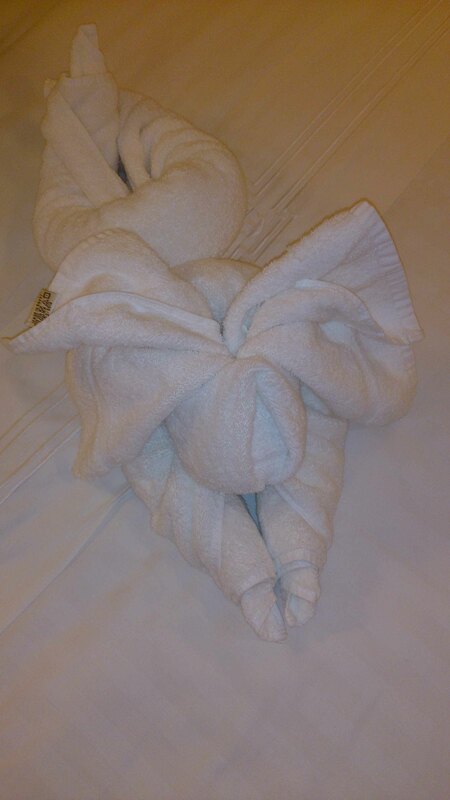 Tonight’s towel arrangement appears to be a puppy. This entry was posted in Family History, Geneacruising, Unlock the Past and tagged 4th Unlock the Past Cruise by cassmob. Bookmark the permalink. I love my statistics and graphs. Think I need to use excel more. I’m looking forward to you blogging about and showing us one of your excel graphs when you get one done. This could interest me. Phew! That’s a lot of fascinating talks. I’m impressed that you’ve had the time to post about them! Great tips, thanks, Pauleen. I’m glad you reminded me about Genies Down Under. It’s been a while since I visited Maria’s excellent website. Lots to follow up, and I like Helen’s idea about timelines. I’m trying that in a very rough and ready way to sort out one elusive ancestor who had the same name as half a dozen other people. I must look out for an example of a more polished timeline. Great post! Genies Down Under is great and Maria is just a lovely person. I will have to play with timelines when I get home for my annoying problem ancestors. Thanks Frances. Enjoying reading all the blogs. Must be a challenge with intermittent and expensive internet connection. Just wanted to share with all the UTP bloggers about TravelPod, an app a friend used when travelling in Europe. It works offline, then when you have a connection you can upload the pictures and text you already have prepared. I think on UTP#5 in July I will use this between ports. Thanks Jenni. You might imagine we’re like people with our arms cut off -no internet, blogs, FB, G+, or twitter. The ship’s internet has been pretty unreliable so most of us have been waiting for port and using our own wifi dongles to submit the posts we’ve already written. Seems to be working. Thanks for the tip re TravelPod -will have to explore that. Some strange woman called Pauleen Cass then talked about Becoming a fan of FANs (Friends, Associates or Neighbours) and did an amazing job. Thanks Pauleen for such a useful and well presented talk. All present thoroughly enjoyed your presentation which deserves to be heard all over the place. Perhaps you could present it as a hangout! Thanks from the meaty one Jill. A hangout…man you like to keep me on my toes. I have appreciated your support throughout the cruise -including taking care of the novice geneacruiser on Day 1.